Here are some problems on pictographs of different objects which are used to give mathematical information through symbols to represent a specific number of objects. Read the pictograph and gather the information which is often related to the objects whose pictures or symbols are used in the table. On the basis of the pictograph students need to answer the questions. 1. 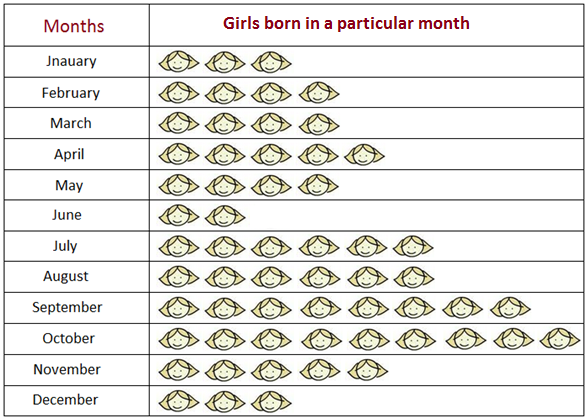 The pictograph showing different months of the year and girls of a class who were born in a particular month. (i) How many girls were born in the month of: (a) September, (b) October? (ii) How many girls were born in the month of June? (iii) In which month were (a) the maximum number (b) minimum number of boys born? (iv) Find the total number of girls in the class. (v) What is the difference between the number of girls born in the months of October and June? 2. Different numbers of plants were planted by the students of a school on six days of a week. This is shown in the following pictograph. (i) How many plants were planted each day? 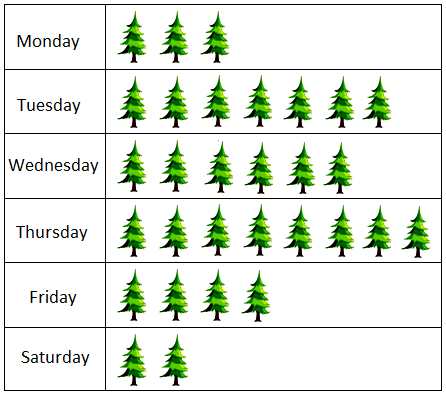 (ii) Find the total number of plants planted during the week. (iii) On which day were the maximum numbers of plants planted? (iv) On which day were the minimum numbers of plants planted? (v) What is the difference between the maximum and minimum numbers of plants planted on the two days?